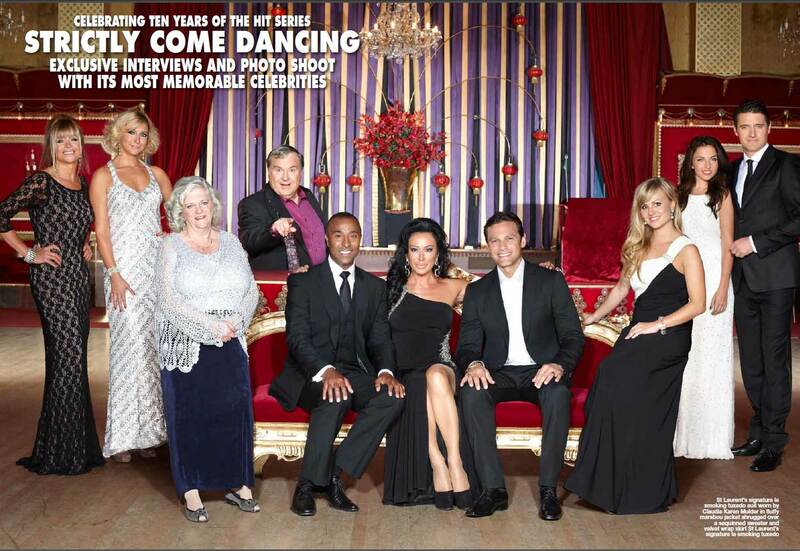 It was all Strictly Stylish for the reunion shoot celebrating 10 years of Strictly Come Dancing, featuring over 6 pages in this week's issue of Hello magazine. Co-ordinating celebs is always a bit of a challenge - so many different sizes (dresses AND egos!). I wanted sophisticated glamour rather than too much glitz and strictly sequins. Colin Jackson, Mark Ramprakash and Tom Chamber all looked really dashing in dinner suits from the amazing Pal Zileri and Marc Jacobs. Nancy dell'Ollio wore an extremely elegant black and diamante dress from Hollie de Keyser, that flattered and (gently) flaunted that voluptuous Italian figure. Jo Wood was fabulous is a black lace dress that looked see-through but was fully lined for just the right amount of head turning glamour. Anne Widdecombe looked quietly glam (and quietly non-plussed about the whole glam milarky) in silver. Tina O'Brian, Louis Lytton and Ali Bastian hit the Vanity Fair sophisicated vibe bang on in black, white and silver from Bernshaw, Debut and Scala dresses. Russell Grant was a little reticent about wearing black dj but I managed to persuade him into it with a purple shirt and patterned silk scarf to give him his signature flamobant edge - and co-ordinated amazingly with the background of the Rivoli Ballroom.